Galway’s Alana Moran and Castlebar’s Sarah Rowe in action on Tuesday night. Sunday will be a special occasion in Eamonn Deacy Park when Shamrock Rovers’ women take on Galway WFC in the Bus Éireann WNL. After a super week in which Galway returned to winning ways with two wins over Cork and Castlebar Celtic, Galway will be brimming with confidence for this fixture. An inspirational performance under lights in Celtic Park on Tuesday night helped them see off their nearest neighbours by 3-0. Galway started the game at a ferocious rate and took the lead in the third minute. 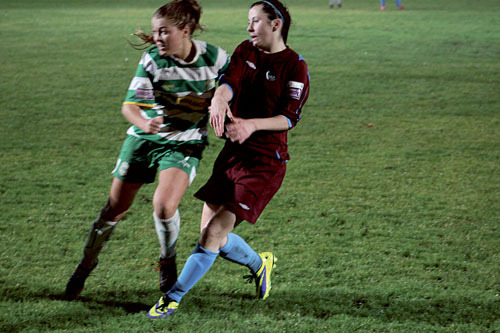 Lucy Hannon, on her return from injury, set up Sinead Taylor whose shot was parried by Celtic keeper Rachel King. However Taylor made no mistake with the rebound to poke the ball into the bottom left of the net. On 25 minutes it appeared Galway had a second when a Lucy Hannon shot struck the crossbar and came down over the goal line. But as keeper King cleared and Galway celebrated, the referee waved play on. Galway continued their dominance in the second half and in the 55th minute extended their lead when Lisa Casserly broke down the left and her cross sailed into the Castlebar net. Two minutes later Taylor brought her WNL haul to 10 goals when she pounced on a Lynsey McKey cross to power home. This was a well-earned victory for GWFC who had to dig deep four days earlier to see off Cork. And it was former Cork star Lynsey McKey who scored the only goal of the game for the Galway women. Manager Nigel Keady said it was a game Galway really needed to win. Gates open at 1pm with kick off at 2pm. Tickets for adults are only €5 and are available on the gate. Children are free. Galway WFC v Castlebar: Melissa Casserly, Shauna Fox, Keara Cormican, Alanna Moran (Ashling Hughes 83 ), Becky Walsh, Ruth Fahy, Lisa Casserly, Grainne Barrett, Lynsey McKey, Lucy Hannon (Aoife Walsh 45 ), Sinead Taylor (Susie Cunningham 84 ).